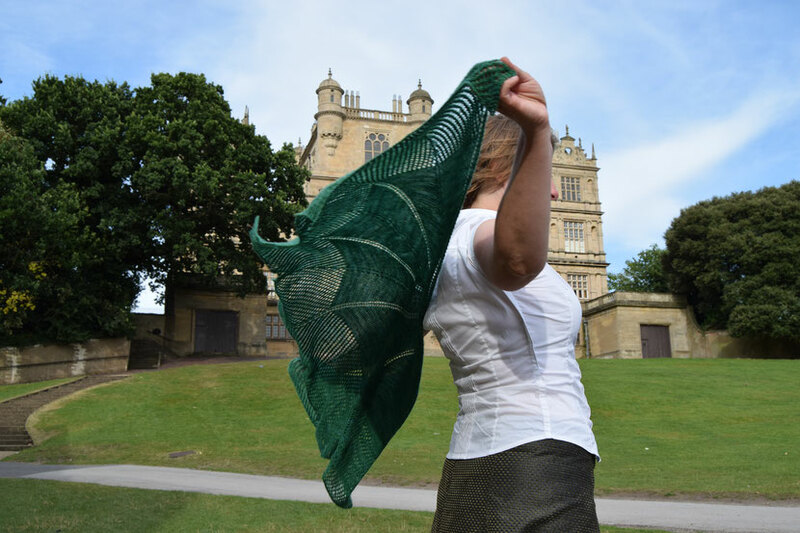 My new shawl design Wollaton. With the onset of Autumn it is definitely time to think about those cosy accessories that complement your seasonal wardrobe. There is nothing as versatile as a shawl or wrap to provide that warmth and a ‘pop’ of colour when taking a stroll through crisp leaves or the pavements of the city. My new design, Wollaton, definitely fits the bill! My design inspiration for Wollaton is its namesake, an Elizabethan country house and parkland located in the city of Nottingham. The 16th century house was designed by the notable architect of the time, Robert Smythson for the Willoughby family. 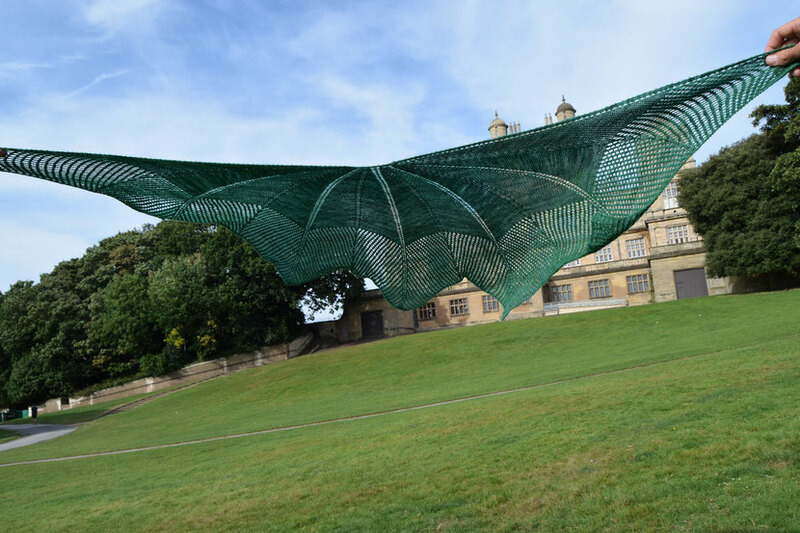 More recently Wollaton has been the fictional home of Bruce Wayne in the Hollywood production of Batman’s ‘The Dark Knight Rises’. My design pays homage to the ‘bat wing’ shape, with five spines radiating centrally and culminating in shapely points. The Falkland fine merino laceweight is beautifully soft, giving wonderful drape and the colourway used is Lyncolne Grene. 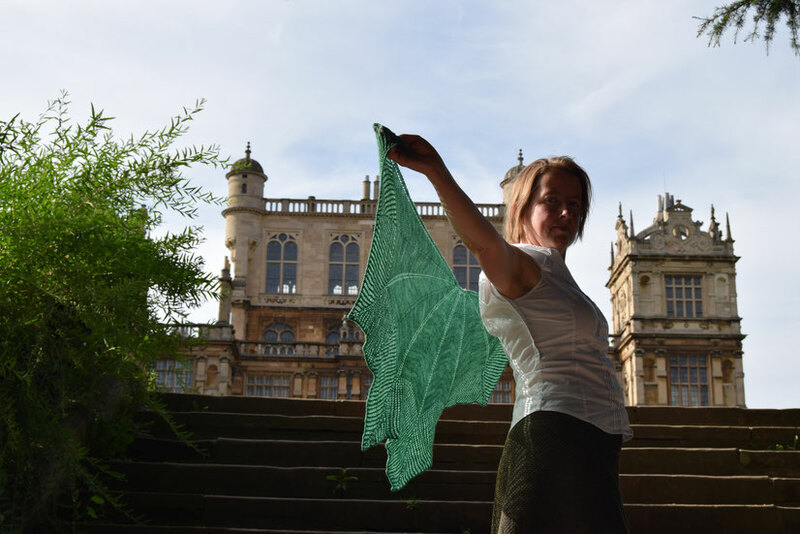 The download for Wollaton can be found on Ravelry. Oh yes, the bats. I have tiny little ones making their rounds in front of my house in the evening, keeping me free from gnats. They live under my roof. What an adequate setting for your beautiful shawl, which is worked to perfection! Hi Ruth, Yes, they are fantastic to watch and they do such a good job :) Wollaton hall (and parkland) is a very beautiful part of Nottingham. Thank you for your kind comments about my design. I am so pleased that you have found sherwood yarn. Wollaton hall is a such a wonderful place and yes, the Natural History Museum is still there too (I love taking my children there).